We look forward to welcoming you to Craglands Guest House for b&b in Keswick in the Heart of the English Lake District. All the bedrooms feature uninterrupted mountain views of Grisedale and Causey Pike or Latrigg Fell. Most of Craglands bed & breakfast accommodation in Keswick is en-suite. Enjoy the unique, relaxed and informal style of b&b accommodation where attention to detail is of paramount importance. Prepare to be tempted by breakfasts and packed lunches with home made dishes from quality local produce. At Craglands Guest House you can choose between double, twin bedded and single rooms - all with superb views of the surrounding English Lake District. Each room has been individually named after a crag on England's highest mountain, Scafell Pike, in the nearby Borrowdale Valley. All bedrooms have colour television, hairdryer and radio/alarm clock together with a hospitality tray of biscuits and Fairtrade tea, coffee and hot chocolate. You will also find fluffy white towels and luxurious bath sheets, shower gel, shampoo, hair conditioner, moisturising liquid soap and cosmetic products have been provided for your convenience. Bathrobes are provided for convenience in the standard single rooms. Due to our stunning elevated position, we are unable to offer any ground floor accommodation. Please inform us if you have any disability, special diet or other requirement that we can assist with to add to your comfort during your stay. Skilling Crag - Cosy double room to the rear of the property with a fantastic view north-east to the wooded slopes of Latrigg Fell. This is a standard room located immediately next door to the house bathroom. Cam Spout Crag - This room is flexible as either a twin bedded or a Kingsize double room with dual aspect windows looking north-east to the wooded slopes of Latrigg Fell. En-suite shower, washbasin and WC. Tom Fox Crag - At the front of the property, this double room has a large bay window and tall side window giving fantastic views to the west of Grisedale and Causey Pike mountain range. En-suite shower, washbasin and WC. 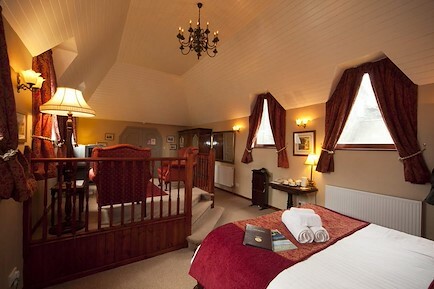 Lingmell Crag - Cosy single room with large window facing south-west towards Grisedale and Causey Pike mountain range. Standard room with washbasin, shares the house bathroom on the same floor. Scafell Crag - A double room of character with dual aspect windows giving fantastic views west and south to Grizedale and Causey Pike mountain range. En-suite shower, washbasin and WC. Pikes Crag - A twin bedded room at the rear of the property with large window looking north-east to the wooded slopes of Latrigg fell. En-suite shower, washbasin and WC. Chambers Crag - Comfortable single room with large window facing east to Grizedale and Causey Pike mountain range. Standard room with washbasin, shares the house bathroom on the lower floor. From the M6, exit at Junction 40 (Penrith) and follow signs for Keswick on the A66. Continue on the A66 for 20 miles, then take the first exit for Keswick to the left (signposted Windermere and Keswick A591). Follow this road into the outskirts of the town until you come to a T- Junction and you are facing a large "Keswick" flower bed. Turn right downhill and Craglands Guest House is the second house on the right. From the South Lakes, follow the A591 for Keswick. As you come down a steep hill above the town you enter the 30 mile per hour zone. Keep heading downhill until you aproach a junction to the right for the A66 - do not turn at this junction but follow the road round to the left and Craglands is immediately on the right. Your enquiry will be sent directly to Craglands Guest House. Please fill in as much detail as you can.